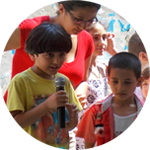 At the beginning of the Wata Al-Musaytbeh summer program, eight year old Youssef was very reserved. He didn't speak to anyone and never participated in any classroom activities. His mother said that Youssef's father had left them when she was pregnant. She clearly expressed hardship and tension in the relationship with her son. Towards the end of the camp, Youssef came out of his shell, gained self-confidence and became more social, and ultimately his relationship with his mother improved. The picture clearly reveals his confidence speaking into the microphone. Sema is a Syrian refugee who arrived in Lebanon two weeks after the start of the school year. She was admitted to Sad Al-Bouchrieh School for Girls and enrolled in a French language class in the after school remedial program with no prior knowledge of the language. Sema showed gradual but significant improvement in the program. After only a few short months, Sema was invited to the UNESCO celebration and wrote a descriptive story in French about her experience. Mohammad had missed two years of school due to war and was placed in second grade when he started the summer program. He was very self-conscious of his abilities, lacked motivation and had a constant look of sadness in his eyes. His teachers worked hard to get him to believe in himself, and by the second week of the summer program he started to change. His confidence level increased and he became a happy learner. He started progressing faster than the rest of his classmates and by the end of the summer camp he was reading and writing independently. Salah shared the story of his parents' death. He drew his house being destroyed in Syria and how he was left all alone with his sister. This tragic event forced them to leave their country and come to Lebanon to live with one of their relatives. Salah will never forget his mother and father but he feels at peace because he's certain they are in heaven. Majd suffered from a speech impediment. After participating in the remedial program, he started to pronounce words more clearly and with ease due to the safe and enabling learning environment he was in. 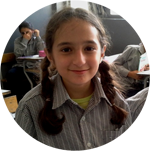 Jelnar is a six year old girl in Daraya Official School. She wrote a story about how her father abused her mother and how this caused her pain. The picture she drew shows her father colored in 'black'. Jelnar's mother works in a bakery to earn a living in order to pay school fees. Jelnar loves her mother and wants to live with her mother and sister on their own. She hopes her father stays out of their lives.